Your home should be your sanctuary. Therefore, you and your family should always feel safe and secure both inside and outside the house. However, with home burglary figures hitting a 13-year high in WA in 2017, many families are beginning to lose their peace of mind. One of the most widespread crimes in Australia, Perth in particular saw a total of 2790 homes targeted by burglars this January, up 2700 from the previous January. This is an extra three a day or an average of one home being robbed every 16 minutes, which is an alarming rate that needs to be addressed immediately. There are a host of tried and tested home security measures that we all know about, which can be taken to prevent the likelihood of your home being burgled. We like to call these qualifiers – security measures that meet a certain safety standard. These measures were once the security status quo, however, as the world continues to change and evolve, so too should the way you go about keeping your home and family safe and secure. Now that we’ve reminded you of the basics, add a whole other level to your home’s security by installing Advantage Air’s smart lighting LED system, MyLights. MyLights manages visibility regardless of whether someone is home, making intruders less likely to enter. It’s also important to note that with traditional security systems, wires can often be visible and thus can be snipped, which will disable the entire system. Not with MyLights. MyLights is hard wired to your home and electronically controlled from one central hub within the home, making it practically impossible for the cables to be tampered with from outside. With MyLights, you also have total control over your lights so you can always arrive home safely according to your programmed preferences. When you’re at home, thanks to the MyPlace smartphone app, you can instantly turn on all your indoor and outdoor smart lights from the security of your bed. So if something goes bump in the middle of the night and you need to investigate, you’ll feel safer in a brightly lit home and won’t even have to get out of bed! 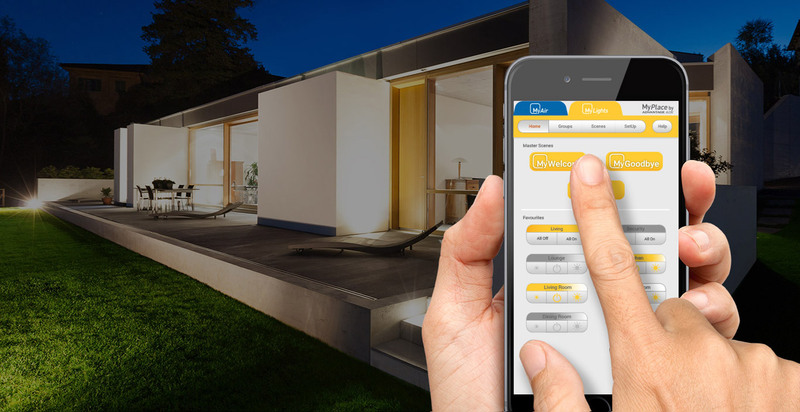 They’re also a great option for when you’re not home, with MyLights giving you the power to control all the indoor and outdoor lights in your home remotely from the same smartphone app. Now you can take comfort in knowing you’re able to control your lights even when you’re on holiday on the other side of the world, so it looks like you’re home. That way, no one will ever suspect you’ve even left the house and you can enjoy some much needed R&R on your vacation. Sunset feature – looks to the Internet for the sunset time in your current location and then turns on your pre-selected scene, with up to 10 scenes that can be programmed. Timers for your pre-selected scenes – Thanks to the timer feature, you can run each scene up to once per day, each day of the week for further control over the security of your home. Is your home empty during set hours of the day? Set a scene timer! Are you home alone in the evenings? Heading straight out from work on a Friday night? You can set custom timers for all of these scenarios. MyLights2 comes with a host of new functions in addition to the security features touched on above. You will just have to stay tuned to find out more! Always feel safe and secure with Advantage Air’s MyLights smart LED lighting system. For more information, get in touch with us today or book a hands on test drive at a showroom near you.